If you're like most people, your home maintenance to-do list is so long, plenty of chores regularly fall off it and into the abyss, never to be remembered. With so much house and so little time, that's understandable. Hey, you're only human! Still, though: Out of sight and out of mind does not mean it's OK. Ignore certain chores, and they can come back and haunt you in a variety of unpleasant ways, from bigger electric bills to foundation problems and beyond. And the truly silly part is that these duties don't take that long to address ... as long as you nip them in the bud before little chores become huge problems, after years of neglect. Curious where these sleeping giants can be found around the home? Here are some household tasks to tackle now before they do you in. You have these things, right? Most homes have one in the kitchen ... somewhere. And even if you know where it is, you probably haven't checked that it actually works. In, like, years. How to do it: Take a look to make sure they're easily accessible. Check to see whether all the seals look intact, and that there's pressure in the pressure gauge. Or, even easier, check the date on the tag, which should note the last time it was serviced by a licensed fire extinguisher inspector. If it's been over a year, you should have it checked again by a pro. 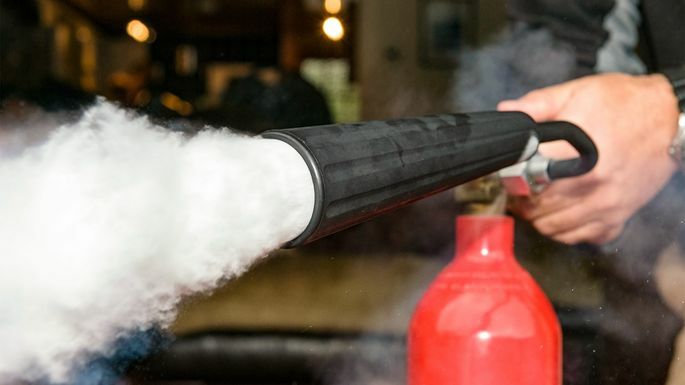 Here's how to find a fire extinguisher inspector near you. It's such an easy thing to check, but easy to forget. Yet you should get on it, since neglecting this small task can have big consequences: Fires and carbon monoxide poisoning can be deadly, but they can also be prevented. How to do it: You should check the manual, but usually you just hold down the test button until it emits an ear-piercing shriek. If the shriek is less than ear-piercing, replace the batteries or even the alarm itself, if it's older than five or six years. Here's more advice on smoke detectors and carbon monoxide detectors. "Drains are the key to effective indoor plumbing maintenance. You need to check all of your drains and make sure they are working properly," says Doyle James, president of Mr. Rooter Plumbing. How to do it: Pour a gallon of water down each drain to make sure it's draining well—if it's slow, that means your drain is partially clogged and could be on its way to a full stoppage down the road. Insert a snake to clear it out. This also ensures proper functioning of the drain trap, a small curved portion of piping under the sink that, when free of debris, fills with water that blocks stinky sewer gases from escaping into your home. That's worth the price of admission alone. This is an easy-to-forget DIY that even the least handy among us can crush. According to Richard Ciresi, owner of Aire Serv in Louisville, KY, homeowners need to change or clean their air filter on average every three months, or every two months if they have pets. How to do it: Just find the filter on your HVAC unit, pull it out, and clean it or put in a new one. "Clean filters can also cut 5% to 10% off your monthly utility bill," says Ciresi. He recommends writing the date on the filter, so you can remember when you changed it. Ever notice an icy breeze when you're standing next to one of your windows? That's a sign that you need to seal up your window gaps. Fixing window gaps is simple, and it'll shave some money off your heating and cooling bills, too. How to do it: If you're not sure if your windows have gaps, Larry Patterson, owner of the Glass Doctor in Dallas, TX, recommends closing them on a dollar bill. If you can pull the bill out easily, then it's time to put in some weather stripping. "Self-sticking weather-stripping is a useful tool for helping windows close more tightly," says Patterson. If you want to go all out, "you can also use caulk around window-frames to fill cracks," he says. Here's more on how to seal windows. Ugh, gutters. Given they're so high above our line of vision, it's easy to forget they're up there at all. But gutters, if clogged, can seriously damage a home. "The downspouts and gutters that are installed around your house are designed to divert water away from your house during times of heavy rain and snowfall," explains James. "To maintain the integrity of your home’s foundation and avoid flooding in your yard, it's important to have your downspouts and gutters cleaned, especially if any debris has fallen from the trees surrounding your property." How to do it: Using a ladder to reach high-up places, check all your gutters for trapped debris. James says animals and birds can make their nests inside the gutter pipe, and you'll only find out because the water passage is blocked. Once you find stuff, scoop the gunk out. Use gloved hands and a trowel, being careful not to damage your gutters. Finally, rinse with a hose, making sure the water flows all the way through to the downspout, away from your house. Spot holes or leaks in your gutters that need repairs? Here's more on how to repair gutters.